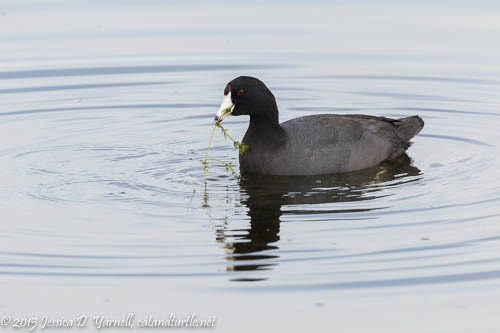 Blog > Beyond the Backyard > Viera Wetlands > Christmas Coot! 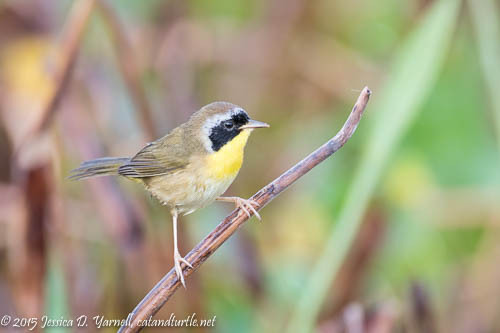 The weather forecast this morning was a little frightful (mostly cloudy), but the prospect of birding was delightful, so I headed to Viera Wetlands to celebrate a wonderful day off from work! It was great seeing Michael, Donna, and Mike as the Belted Kingfisher “Miss Viera Sushi” mocked us and evaded her favorite perch. We’ve having record hot temperatures in Central Florida – it’s expected to hit 87 tomorrow on Christmas Day! 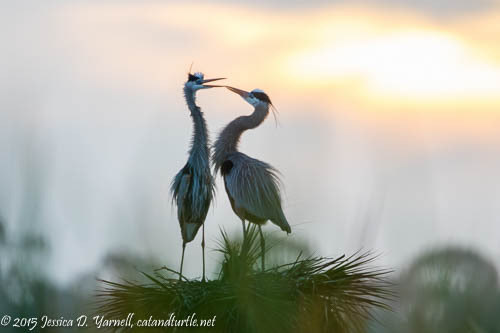 Usually Viera mornings of watching the nesting Great Blue Herons involve extra layers, a hat, and a scarf. Today the pale skies added to the tropical feeling as I wished I had worn shorts! 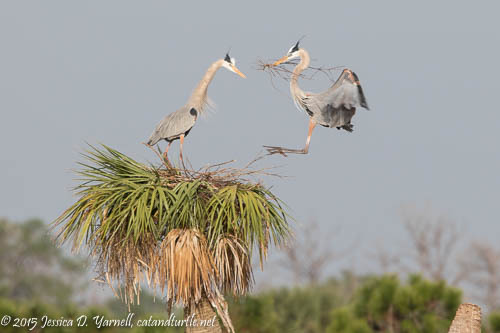 Who can resist taking a few photos of the Great Blue Herons as they bring nesting material into their trees? I love this time of year, when the tall, lanky wading birds turn into beauties and strut their breeding feathers. The Great Blues are so graceful as they stand together in their nest and carefully place each twig. 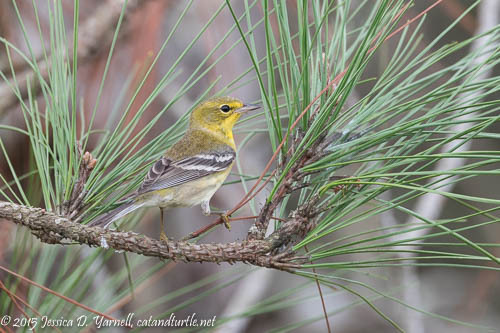 Thanks to Michael’s good eye, we turned around and got a few shots of a pair of Pine Warblers in the — you guessed it — pine trees. 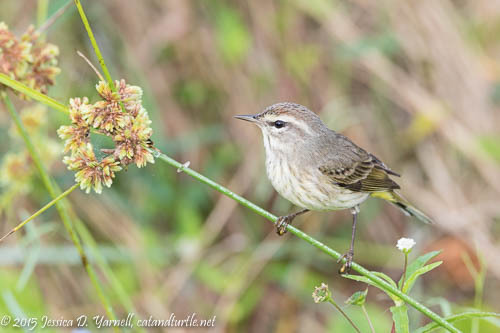 They were joined by a couple of Yellow-Rumped Warblers also. I was on my way out when Donna spotted the best bird of the day. A Horned Grebe! Silly bird, he posed up close for Donna and Mike, then headed far away behind the reeds before Michael and I could get there. But he did do some struts for the camera, so we forgave him for trying to evade our cameras. 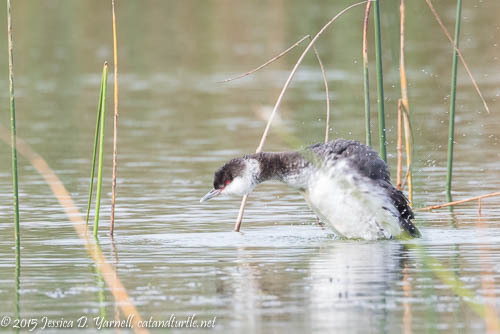 A Horned Grebe is a good bird for Viera Wetlands. Another Christmas present! What a wonderful place to spend Christmas Eve, or any other day! When you get a photograph of a Christmas Coot, you know it’s been a good trip.